The National Endowment for the Humanities (NEH) is an independent federal agency created in 1965 and is one of the largest funders of humanities programs in the United States. Because democracy demands wisdom, NEH serves and strengthens our republic by promoting excellence in the humanities and conveying the lessons of history to all Americans. The Jack, Joseph and Morton Mandel Humanities Center at Cuyahoga Community College is a new initiative that offers students the opportunity to study the humanities in a way that engages them in the community and develops their leadership skills. The Center is the result of a $10 million gift from the Mandel Foundation, the largest gift in the history of the College. 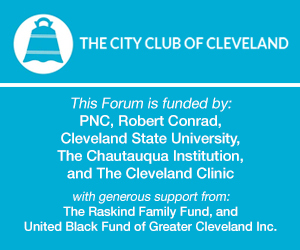 This conversation is about how to connect the humanities with civic engagement and features William D. Adams, Chair of the National Endowment for the Humanities, and Lauren Onkey, Ph.D., Chair and Dean of the Jack, Joseph and Morton Mandel Humanities Center at Cuyahoga Community College.